The draft Law on Tax Administration (amended) adds a lot of new regulations to meet tax reform requirements to further help taxpayers. 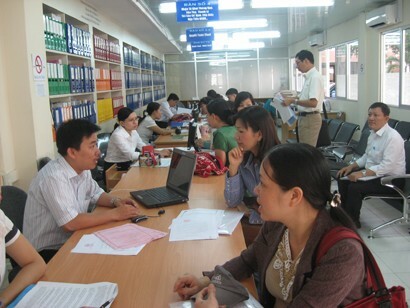 Mr Cao Anh Tuan, Deputy General Director of the General Department of Taxation, said, the draft law increases rights and facilitations for taxpayers. Specifically, taxpayers will know the time limit for tax refund, the value of unrefunded tax and legal reasons for unrefunded tax. In addition, the bill adds provisions on time limit for submission of tax documents, electronic tax payment records in case of technical faults; time limit for submission of lumpsum tax declaration records; time limit for filling missing records; deadline for paying tax and delayed payment of additional tax to ensure uniformity, clarity and transparency between taxpayers and tax authorities. Amending regulations on time limit for finalisation of personal income tax is one of remarkable changes of this bill, he said. The current rule provides that an individual with two or more sources of income must directly settle final tax payment with tax offices. If he has paid less than he has to, he must fill it up or if he has paid more than the amount he needs to, he can request for a refund. “In order to assist taxpayers in integrating annual incomes before making final tax settlement and mitigating risks, the draft law revises the tax settlement period for individuals to 120 days from the last date of calendar year, one month more than the duration fixed for enterprises,” Tuan said. Although there are regulations on electronic invoices, this option is not compulsory on a large scale. Businesses are still allowed to use multiple forms of invoices and most are opting for paper invoices and just a handful choose electronic invoices. As a result, the revised Law on Tax Administration also supplements regulations on electronic invoices and electronic records because current rules on printing, issuance and use of invoices are basically built for the application paper invoice management. “The application of electronic invoices, especially officially authenticated electronic invoices in recent time, shows that the application of electronic invoices reduces the time of handling administrative procedures for businesses and tax authorities; reducing costs for businesses; preventing invoice counterfeiting and fraudulence, and cutting the cost for the whole society,” Tuan stressed. Furthermore, to promote electronic transactions, the draft law increases regulations on tax administration for e-commerce. In view of that, tax authorities will build databases and widely deploy electronic tax services such as electronic tax declaration, electronic invoicing and online tax payment; supplement regulations on responsibility of ministries, branches and units for e-business activity of organisations and individuals with tax offices. Apart from 10 rights of taxpayers stipulated in the current Law on Tax Administration, the draft amends and adds two rights of taxpayers: (1) Taxpayers are entitled to know the time of settling tax refund, the amount of unrefunded tax, and the legal reason for unrefunded tax; and (2) taxpayers are not subject to penalty for tax violations or late tax payment in case of following the order of tax authorities. On tax payment responsibility, the bill replaces regulations on deadline for payment of quarterly corporate income tax to at most 30 days from the first day of the subsequent quarter and adds provisions on tax payment applicable to crude oil and natural gas. For cases where taxpayers pay late as a result of natural calamities, fires, epidemics, serious diseases, unexpected accidents, or other force majeure events, they may request for late payment. The draft also amends tax exemptions for households and individuals subject to agricultural land use tax and individuals directly paying salary-based personal income tax with an annual tax of VND50,000 or less.